It was 4:49 a.m., when I heard his first crow. Normally, I’m a sound sleeper, but this morning it sounded as if the neighborhood rooster was directly underneath our bedroom window. Turns out, I was correct. The bird, who’d been hanging around the road and top of our driveway for several weeks, had ventured down into our yard. Having never been around chickens—except in the grocery store—I was unfamiliar with their idiosyncrasies and had no idea roosters crowed nearly non-stop from dawn to dusk. We assumed he belonged to a neighbor down the road, but now we’re not so sure as no one around here is taking responsibility for him. As of today, it seems he’s selected us as his family du jour. Unfortunately, he didn’t make fast friends with Gary this morning, so he may not be staying. While Gary was getting into his car, the rooster decided to defend his new territory and went after Gary (wish I’d seen that!). 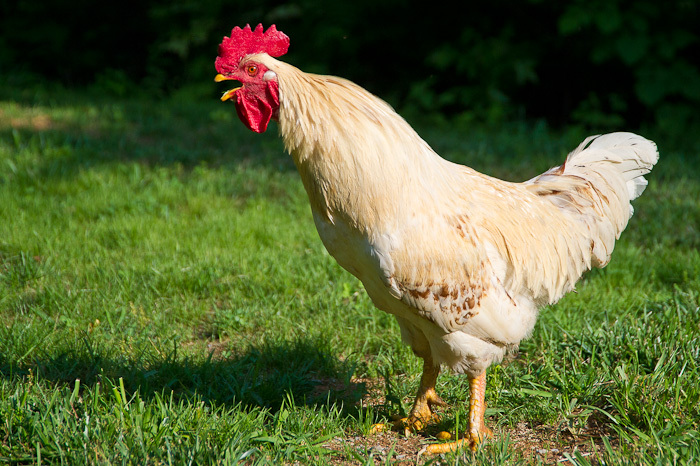 Thankfully, the rooster was in bed when Gary returned home because, with golf club in hand, he went looking for him tonight. For the rooster’s sake, I hope to hear his crow tomorrow morning, but, on the other hand, a few more hours of uninterrupted sleep would be nice, too. Ah…..beautiful rooster and he is just out looking for a hen. I hope Gary isn’t really serious about doing him in with a golf club. What fun to have him share your home!! !